I will be speaking / giving workshops at this year’s OFFF in New York, November 2-4. In case you aren’t familiar with OFFF, it is a festival focusing on the “post-digital creation culture”. Translation: A lot of great people and great designers in one place talking about the things they do and how they do them. There are all sorts of people who attend and present at the OFFF: interactive designers, print designers, ad agencies, experimental artists; it really is an incredible experience and every year I am amazed at the things I see there. I have been involved for the past couple years, both of which were in Barcelona. 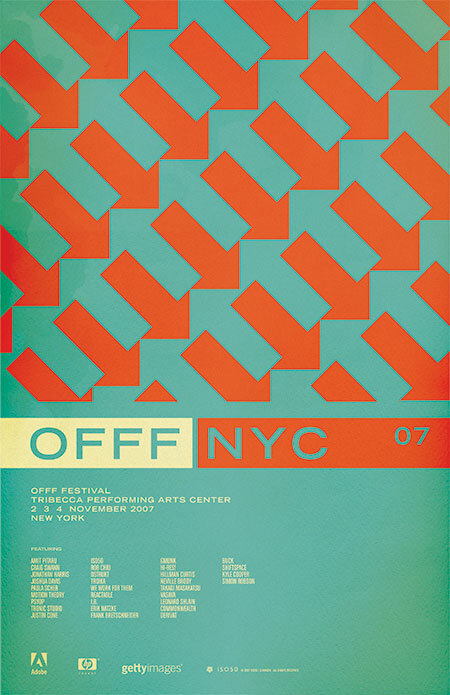 This will be the first year the OFFF has come to the states, held at the BMCC Tribecca Performing Arts Center in New York, NY. There will be an ISO50 booth at the event with prints, shirts, and music. Stop by and say hello. Tickets and information are here. The poster (above) is based on a pattern I saw painted on an old, crumbling wall in Barcelona (the city where OFFF began). I always wanted to incorporate it into a print and thought this was the perfect time. I think they sort of play on the energy of New York, lot’s of people and things moving in different directions and they tie the concept back to the origin of the festival itself. I played with having the arrows running up and down (as the original painting I saw had) but the 45 degree angle seemed to translate the dynamic, energetic vibe I was going for a bit better. The colors are meant to confuse the eye a bit and enhance the double arrow effect going on. I chose classic, practical typography to balance the piece and hopefully give it a more timeless feel. Incidentally, after posting this I was looking at it on the front page of the blog. I scrolled down and saw the recent post on the NFB and realized how similar the two images are. Perhaps a case of subliminal inspiration? Funny how things like that can happen as I definitely didn’t have that NFB poster on my mind as I was designing this, but the similarities and time frame seem to rule out coincidence. And on another aside; this is one of the, if not the first posters I’ve ever done without a border. As I look back at my collective works it’s sometimes surprising to see these common themes and elements crop up here and there. Some are intentional, but others, like the borders, just seem to be these dogmatic devices which aren’t always necessarily the best choice for the given project. Ha, I feel like going back and turning on and off the borders of all my older works to see which looks better. 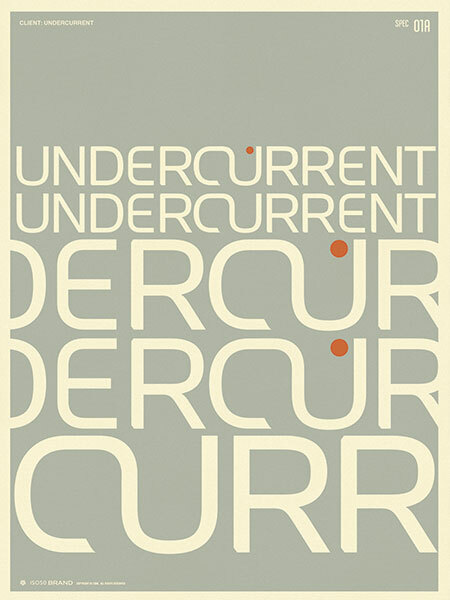 Branding I did for Undercurrent this summer. Just an example of how I typically present concepts to clients. Love vaulted ceilings, love skylights, love plenty of angles. 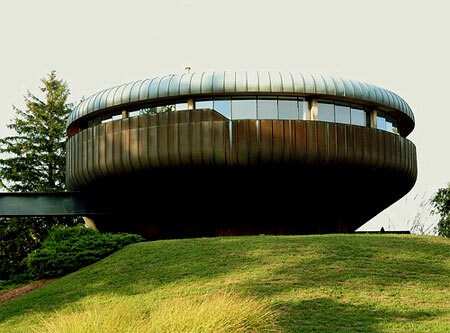 Is this a home or a cabin? Not sure of the details on this, if anyone has any info let me know in the comments. Obviously a few things could have been handled with a bit more restraint (never been a huge fan of oak), but overall it’s a great feel. 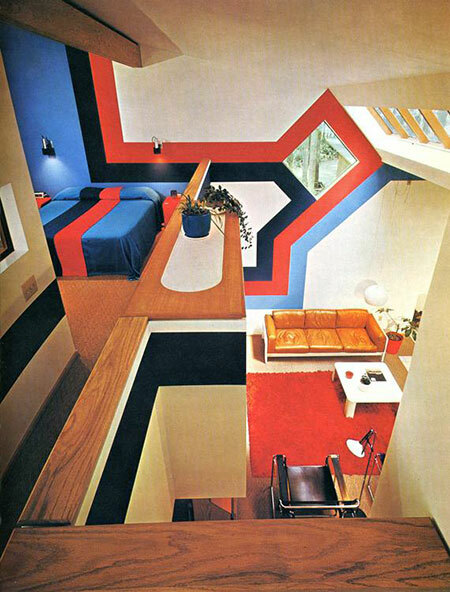 If some crazy design comes off the wall and turns into a bed, you really can’t complain much. $20 says there’s a matching Porsche parked out front with perforated leather driving gloves in the console. Seems to be some variant of the Marcel Breuer Wassily Chair in the foreground, name that couch. Whenever I see setups like this I always wonder who lived in them, did they actually get much use out of the place? Wonder what it looks like now….probably totally gutted and replaced with stock art fake paintings and plastic floral arrangements everywhere. Just started to process all the photos from this summer’s Barcelona trip where I was speaking at the OFFF design conference. Unfortunately, my third Lomo LCA has broken so I lost half the shots (the film was not advancing properly half of the time). If you’re not familiar with the Lomo LCA, it’s a small Russian-made camera famous for it’s lofi vibe and heavy color saturation. It also has this really cool vignette effect that sort of pulls all the attention to the center of the photo. But as my three dead cameras will atest, they are very temperamental and prone to breakage. I treat all my equipment with almost obsessive care, yet these still fell victim to their own shoddy construction. This wouldn’t be such a big deal, they use to be only $99 a pop. But since they gained popularity and became a cult favorite around the turn of the century, Lomo has jacked up the price to $250 usd. In a side note, I owe my name in part to this camera and French designer Arnaud Mercier. Arnaud taught me a lot about photography and first suggested that I try the LCA with Fuji’s “ISO50” speed slide film, hence the moniker. After all that talk of the Lomo, I have to admit, the image above was not taken with it. This is a digital photo taken with a Nikon D80 or a CP8800 (can’t remember which I was carrying that day). Since I lost the film shots of this scene, I tried to make these digital shots appear as much like the output of the Lomo as possible. You can be the judge of how successful I was (Hint: Not very..). As I get these together and scan the remaining slides I will post them here and to my Flickr. 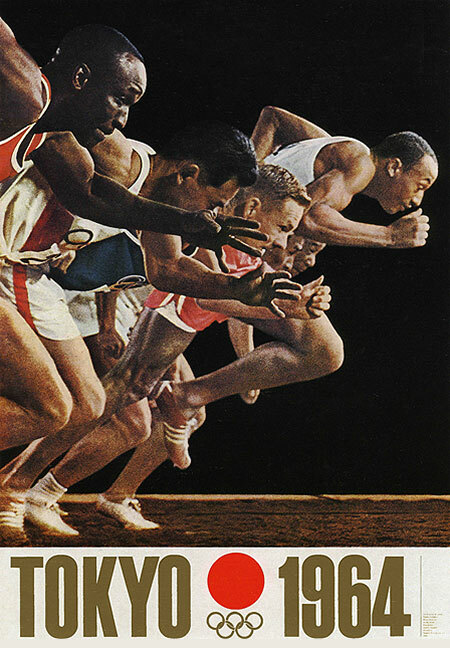 One of the original posters from the 64 Tokyo olympics. Simple and effective, the gold/red color scheme is perfect. 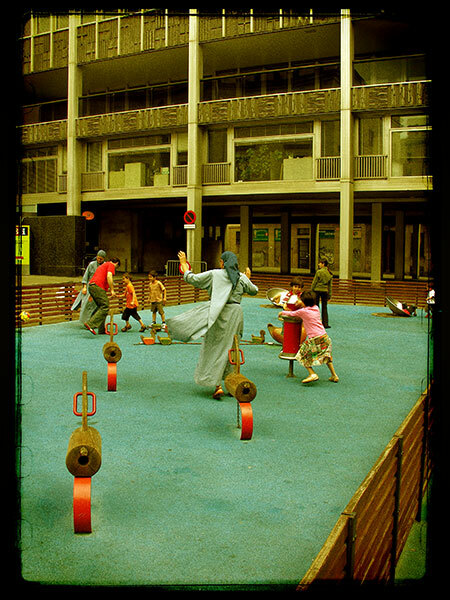 Love the grain of the photo, yet another beautifully organic phenomena we have lost to the digital revolution. 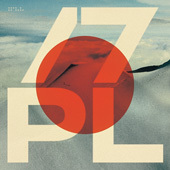 Design magazine Issue 239. Very nice color combo, similar to the Mexico Olympics cover. 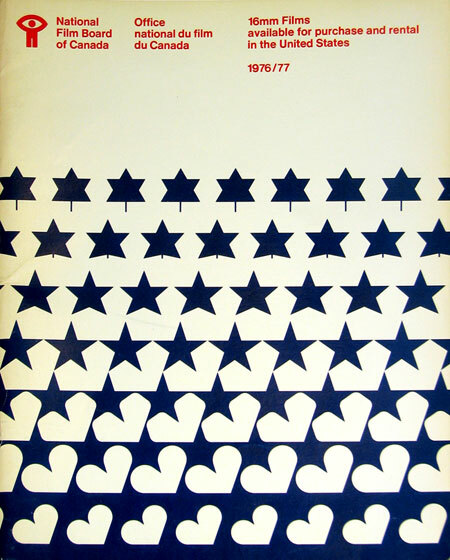 The cover story reads “Perspex and the transparent look”. Perspex is a transparent glass alternative heavily used in 1970’s interior design. They utilized fluorescent colored Perspex for all sorts of furniture and installations. My neighbor had a lot in his old SF Victorian until they remodeled. Should have snagged a picture before they tore it out. 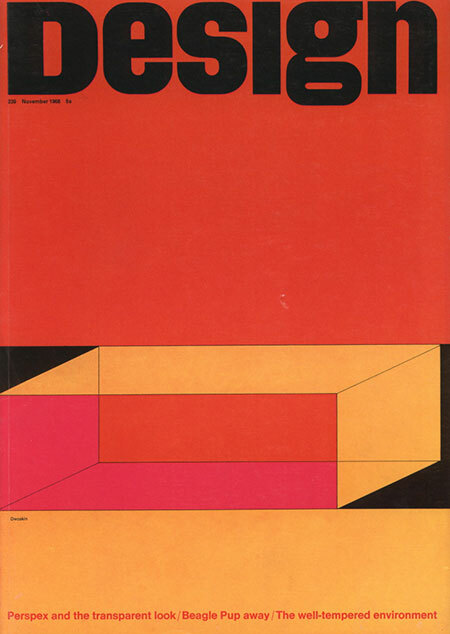 The colors featured in the illustration on the cover of this magazine must have been the common choices, as I recall his were all in these tones as well. J went and took some photos of the Wil Armster designed Condo. Still looking pretty nice, thanks J. More Pics at his Flickr.